Here’s a recipe PLUS a bonus! Each part of this recipe deserves it’s own post, but since they are connected, I decided to post them together. 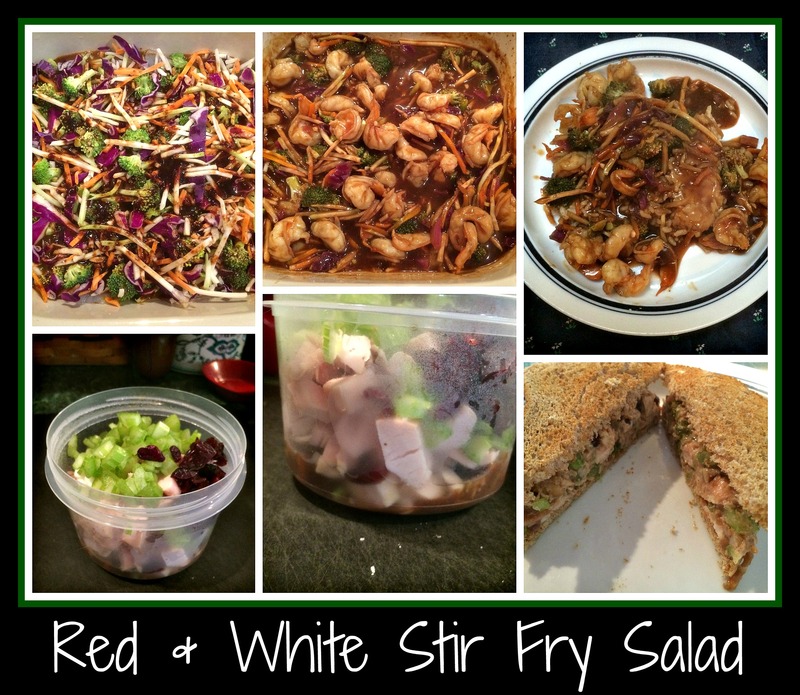 It’s a recipe for “stir fry” AND a chicken salad recipe…in one recipe! I was trying something new… I wanted to make a shrimp stir fry, but wondered how it might work if I tried to “bake” the ingredients for a stir fry. To do this, I sliced a pound of de-shelled shrimp length-wise and used them to cover the bottom of a 9×9 pan. I sprinkled a package of slaw (the kind with shredded cauliflower and broccoli) over the shrimp and then made a sauce of hoisin sauce, red wine, garlic, ginger, and a little cornstarch (for thickening) to pour over the entire pan. I covered the pan with foil and allowed it to bake at 350 degrees for 20-25 minutes. A package of microwave brown rice finished off my first meal nicely (see top right-hand photo). While the technique was unconventional, it was a great way to make a simple dinner without standing beside the stove top. The second half of this recipe (the “Salad” portion) came about from my need to use up the half-cup of leftover stir fry. I had a chicken breast in the fridge that also needed to be used, so I decided to try putting everything together to make a chicken-shrimp stir fry salad sandwich. Weird, but it really was tasty. I combined the following ingredients: leftover stir fry, one diced chicken breast, one diced stalk of celery, a small palmful of craisins, some mayo, white wine, salt and pepper. I mixed everything until it was well combined, adding either mayo or white wine, depending on the desired texture, and then put the mixture on some toasted low-calorie bread to make a sandwich. The threads of veggies from the stir-fry provided some interesting texture in the salad, but it was a great mix and the bits of leftover stir fry sauce added some zing to the flavor. It was definitely a great way to use up leftovers in my fridge. I hope this set of recipes gives you some ideas of ways to re-use foods in your own fridge. Using red wine in the stir fry and white wine in the chicken salad was a fun inspiration as well… see what you can create when you go beyond the traditional and let your creative juices flow! This entry was posted in chicken, easy dinner, easy recipe, red wine, shrimp, white wine, Wine and tagged chicken salad, dinner recipe, double-duty recipe, lunch recipe, salad, shrimp recipe.